Solidscape Inc. will present this new printer in preview at the Vicenzaoro tradeshow in Vicenza, Italy, from January 18 to 23. 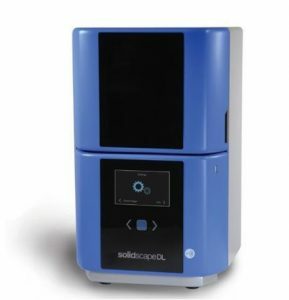 Prodways Group unveiled the first DLP 3D printer by Solidscape Inc. – a Prodways Group company specialising in the manufacturing of high-precision 3D printers and materials. It manufactures printers & materials targeted to the jewellery industry. With the launch of SolidscapeDL, its first high-precision resins production 3D printer. Solidscape has been in the jewellery market since the last 20 years and has hence become synonymous with the high quality and high standards of the industry. According to the company, its cutting-edge engineering and high quality castable wax models made its systems the 3D printers of choice for the most demanding customers worldwide. Six months after Solidscape joining Prodways Group, the same approach guided the emergence of the new resin production 3D printer – SoldiscapeDL – and the castable resins associated to provide the best results in combination with this technology. The new SolidscapeDL 3D printer combined with the new jewellery resins developed by Deltamed, a Prodways Group subsidiary dedicated to 3D printing resin development, will offer a new alternative for high speed manufacturing while cutting production cost by a third. The experience of Prodways Technologies with the DLP® (Digital Light Processing) technology – core engine of the MOVINGLight® machine series – and the know-how of Deltamed in the development of custom resins for additive manufacturing, have been key factors to the success of this project, highlighting once again the power of Prodways Group integrated strategy (3D printers, materials, software and part manufacturing). This new machine will join Prodways Group resin 3D printer portfolio and provide materials recurring revenue. 3D printing technology has transformed the dental and hearing aid production sectors in a few months. Prodways Group wants to pave the way to the overall jewellery market direct 3D printing revolution. Today, around 10% of global jewellery production uses direct 3D printing, mainly in the high-end jewellery segment. The objective of Solidscape is to increase this percentage to 50% within 5 years. Targeting a wider range of jewellery manufacturers, the SolidscapeDL will make their investment processes smarter, more efficient, beautifully precise and profitable. The official launch of the SolidscapeDL will be at the beginning of Q2 2019. Prodways Technologies is one of Europe’s leading manufacturers of industrial 3D printers, offering a broad spectrum of multi-technology 3D printing systems and related premium materials. Building on revolutionary and proprietary technology, MOVINGLight®, PRODWAYS GROUP today has global visibility in the industrial 3D printing sector and with leading customers.